In a marriage of quantum science and solid-state physics, researchers at the National Institute of Standards and Technology (NIST) and the University of Maryland have used magnetic fields to confine groups of electrons to a series of concentric rings within graphene, a single layer of tightly packed carbon atoms. This tiered “wedding cake,” which appears in images that show the energy level structure of the electrons, experimentally confirms how electrons interact in a tightly confined space according to long-untested rules of quantum mechanics. The findings could also have practical applications in quantum computing. The researchers, who report their findings in the Aug. 24 issue of Science, began their experiment by creating quantum dots — tiny islands that act as artificial atoms — in graphene devices cooled to just a few degrees above absolute zero. A scanning tunneling microscope, which images surfaces with atomic-scale resolution by recording the flow of electrons between different regions of the sample and the ultra-sharp tip of the microscope’s stylus, revealed the structure. “Since we see this behavior begin at moderate fields of just about 1 Tesla, it means that these electron-electron interactions will have to be carefully accounted for when considering certain types of graphene quantum dots for quantum computation,” said study coauthor Christopher Gutiérrez, now at the University of British Columbia in Vancouver, who performed the experimental work at NIST with coauthors Fereshte Ghahari and Daniel Walkup of NIST and the University of Maryland. This achievement also opens possibilities for graphene to act as what the researchers call a “relativistic quantum simulator.” The theory of relativity describes how objects behave when moving at or close to light speed. And electrons in graphene possess an unusual property — they move as if they are massless, like particles of light. Although electrons in graphene actually travel far slower than the speed of light, their light-like massless behavior has earned them the moniker of “relativistic” matter. The new study opens the door to creating a table-top experiment to study strongly confined relativistic matter. Collaborators on this work included researchers from the Massachusetts Institute of Technology, Harvard University, the University of Maryland NanoCenter and the National Institute for Material Science in Ibaraki, Japan. 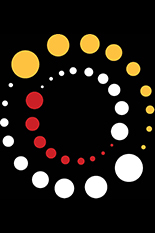 The University of Maryland and NIST have a cooperative agreement to broaden collaborations in research efforts in development and manufacturing at the nanoscale, sponsoring fellowships and travel grants for UMD researchers who use the NIST NanoFab facilities. Christopher Gutiérrez, Daniel Walkup, Fereshte Ghahari, Cyprian Lewandowski, Joaquin F. Rodriguez-Nieva, Kenji Watanabe, Takashi Taniguchi, Leonid S. Levitov, Nikolai B. Zhitenev, and Joseph A. Stroscio, Science. Published August 24, 2018.